Was your neighborhood recently hit by hail? If it was, chances are that you will soon have many roofing contractors knocking on your door. Chasing hailstorms is big business. There is huge electronic infrastructure set up that facilitates contractors being able to locate storms, gauge their magnitude, determine the affected neighborhoods, know the size and value of the homes, work with insurance companies, and even bid the roofs sight unseen if they want to! We are pretty wary of these “storm chasers” and encourage the use of local, experienced contractors who are properly licensed and insured to work in your area. We encourage using contractors who will still “be there” if problems occur down the road and your roof requires service. Our steel roofs, as well as other metal roofs, have been used extensively in severe hail areas with great success. We warrant our products to not leak after hail storms and we also warrant the coating on our products to not chip due to hail. Another big benefit to metal roofing is that it will resist hail just as well when it is many years old as it will when it is new. That is not the case with most other roofing materials which become soft or even brittle as they age, making them more susceptible to hail damage. Our products, as well as most metal roofs, carry the UL 2218 Class IV Impact Resistance rating. This is the highest rating available and, to pass the test, the products must survive a hit by a 2” steel ball dropped from 20’ in the air without splitting or coming apart. That is significant and few types of roofing can pass that test. Having a roof with the UL 2218 certification means that you might be eligible for discounts on your homeowners’ insurance premiums. However, many insurers will require that you sign a “cosmetic damage waiver” in exchange for the discount. This waiver means that, if you have a severe storm that causes cosmetic damage to your roof but does not make the panels break open in some way, they will not replace your roof. This would be similar to signing a waiver for your car stating that your insurance would not cover hail damage unless it prevented the car from operating. Our usual suggestion is to not sign the waiver and, therefore, not take the insurance premium discount. You can rest assured knowing that you have a hail resistant roof but also that the roof will be replaced if a storm hits that is severe enough to cause cosmetic damage. We feel that giving up cosmetic damage is not worth the insurance premium discount in most cases. And, from the insurance companies’ standpoint, we understand this. They like metal roofs for their hail resistance but they also know that, if they must replace a metal roof, it is at a higher cost than standard roofing. We appreciate the reasoning of the cosmetic waiver. So, if you have a metal roof and it gets hit by a hail storm, what should you do? Again, regardless of what type of roof you have, if your neighborhood gets hit by hail, you will have lots of contractors knocking at your door and roaming around your neighborhood. Many will actually be from several hundred miles away though they will have often somehow obtained a local address that cleverly disguises that fact. Some may even tell you stories such as they were sent by the manufacturer of your roofing to come do an inspection. Don’t believe them. No manufacturers do that. They may also push you to just sign a paper allowing them to make and settle an insurance claim on your behalf. Don’t do it unless you know and trust the contractor very well and have verified they are local and experienced with your type of roof. You lose all control once that paper is signed, committing yourself to using them as your contractor. If you have a metal roof that gets hit by hail, we first suggest that you perform a visual inspection. Walk around your home. If possible, look out of upstairs windows onto lower roofs. Do you have a ladder that will allow you to safely look down into the roof? We do not suggest getting on the roof but just inspect it the best you can. Use binoculars if those are helpful. Do you see cosmetic damage? Do you see evidence of more significant damage such as locks or seams that have opened up or flashings and trims that have broken loose? If you see this more significant damage, then we suggest contacting the contractor who installed the roof to come take a look at things. If that contractor is unavailable, contact the manufacturer of your roof to find out who in your area is experienced with it. If you see cosmetic damage but no functional damage, it gets a little tricky. If the cosmetic damage is so minimal that you wonder whether it was even really caused by the hail, you will probably be fine to ignore it if you wish, especially if your metal roof has a high quality finish. However, ignoring more significant cosmetic hail could become a problem if you ever have to go through a home inspection for the purpose of selling or refinancing your home, or obtaining insurance coverage. In the case of cosmetic damage that is more apparent and was obviously caused by the hail, we suggest contacting your original roof installer for an inspection. They will be able to help you assess the extent and risk of the damage and determine whether contacting your insurance company is appropriate. A contractor who is knowledgeable of your roofing system will also be able to help determine whether repairs are suitable or if replacement is necessary. If the original contractor can’t be located, contact the roofing manufacturer and ask who is local to you that has experience with your roof. Again, be wary of “storm chasers”. Never allow anyone on your metal roof unless you know and trust them and know they are experienced with your metal roof system. Insurance companies determine whether to “total out” roofs on the basis of how many hail hits are visible in a certain roof area. It is easy for unscrupulous contractors to go to a hidden area on a your roof and “create” hail hits that weren’t really caused by hail. Don’t fall victim to this or other scams. Metal roofs offer homes great protection from hail and other severe weather. By being a careful consumer, you will be able to ensure making good decisions for your home now, and in the future. The key to finding the right metal roof is research. 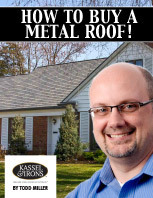 Download our ebook and educate yourself for a better experience when buying a new metal roof. Includes a Free checklist to ensure you get answers to all the right questions.